Although 12x12 remains the dominant size in the scrapbooking world, there are an increasing number of crafters who are working with the 8x8 page size. Albums made with 8x8 scrapbook layouts take up less room on your bookshelf and are generally quicker to create than full 12x12 scrapbook pages since you have less space to work with. 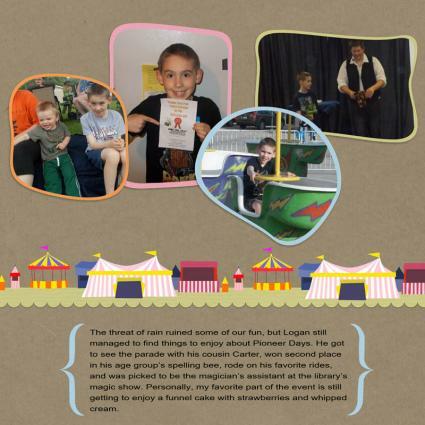 The digital scrapbook examples in this article were created using Serif's CraftArtist software. 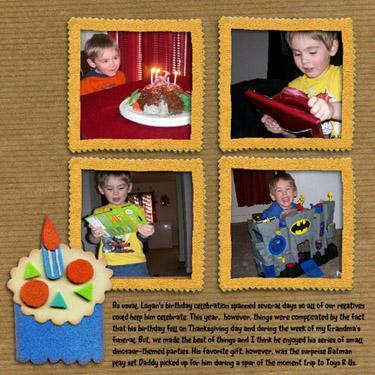 Making 8x8 scrapbook layouts on your computer is a great idea because you can print them at home using any standard inkjet printer. If you are not a digital scrapbooker, however, the same basic layout structure used in these examples can be recreated using traditional paper scrapbook supplies. Arranging four, equal-sized photos into a grid formation, as shown above, is an easy way to pull together an 8x8 scrapbook layout. Start by choosing decorative photo mats like the yellow rickrack mats in this example. Then choose four slightly smaller photos to be centered on each mat. Each matted photo should be roughly a 3x3 square. Finish your layout by choosing one large embellishment that represents the theme of the page. Add journaling that provides essential details such as when the photos were taken, who is in the pictures, and why they are important. The journaling in this example is done using Apple Boy 18-point type. This layout uses varying sizes to quickly show you which photo is the most important. This type of design works well for pages where you want to include images of things that wouldn't have much visual appeal alone, such as a photo of the holiday meal you cooked for your child or images of a craft project you made together. To get this look, start by embellishing the page with a touch of patterned or textured paper in the opposing corners (so that the photos can be laid on top). The faux cardboard in this layout adds interest without taking attention away from the photos. Lay the larger photo first, which is 3-1/2 x 4-3/4 inches. The smaller photos are 2-1/4 x 2-1/4 inches square. Since there isn't much space for journaling with this particular layout design, add a short caption. If you are making an album with a double page spread, however, you could easily add journaling on the opposite page. The caption on this layout is done in 18-point Impact. If you want to use a large photo that is a horizontal image, simply rotate the design so your bigger photo is on top and the two smaller photos are directly underneath. Add the text underneath the smaller photo on the right hand side. If you have photos that are important for sentimental reasons, but are not necessarily high-quality images, consider cutting them into decorative shapes before adding them to your page. To get this look start with four photos that are cut to be roughly 2-1/2 inches wide. Cut out colored photo mats to be slightly larger than the photos themselves. Arrange the images to overlap so that you can include multiple photos on the page without making the layout look cluttered. Add a themed embellishment such as a border in between the photos and the journaling. The border in this example is about an inch tall. The journaling in this example is done using Utsaah 13-point type. Cutting photos into shapes works well for pages with a playful theme, such as a page of photos from a carnival or a child's birthday party. Even though most scrapbook layout ideas feature matted photos, it's fine to make a page or two without photo mats. 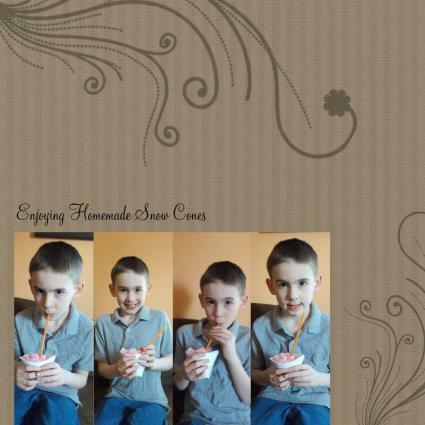 This technique is great for photos that are very similar, such as the photos of a boy eating a snow cone shown here or pictures of a child learning to ride a bike for the first time. Start by cropping each photo. Each photo in this strip is 1-1/2 x 3-1/2 inches. Lay each photo directly side-by-side with no space in between. 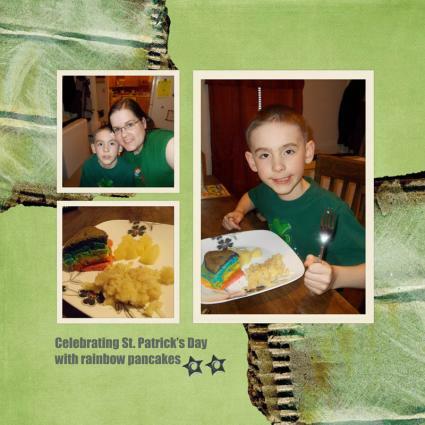 Arranging your photos so they are directly next to each other creates an interesting effect on an 8x8 scrapbook layout. Add a caption title above the pictures. The title on this layout is done in 32-point Monterey BT. Use a smaller sans serif font if you would like to include a few sentences of journaling beneath the title. To vary the look of this type of layout, trying placing a strip of photos running vertically across the left hand side of the page instead of horizontally across the bottom as shown here. While the general process for scrapbooking is the same regardless of what size of page you choose to create, there are a few tips that should make it easier to design 8x8 layouts you'll be proud to show your family and friends. Keep your design simple. A scrapbook page should always make the photos and journaling the center of attention, but this is especially important when working with smaller projects. Limit embellishments to a few key items that really reinforce the theme of your page. Including memorabilia like newspaper clippings, postcards, brochures, and ticket stubs can be difficult when you're making a smaller scrapbook album. However, taking pictures of these items or scanning and reducing them can be a good way to effectively include them in your project. If you're using an 8x8 album for a theme project, such as a vacation scrapbook or memories of baby's first year, choose a product line with coordinating papers and embellishments to help give a sense of continuity to all your pages. Even though an 8x8 scrapbook layout is smaller than the standard 12x12 page, you can still make a big visual impact. The key is to keep things simple and focus on displaying the photographs in an appealing way.